Summer theater program involves local youth – Welcome to Wyandotte Daily! As a part of its expanding education outreach, KCRep launched its first Youth Summer Theatre Ensemble program under the umbrella of the EnrichKC programming. Thirty-six cast members from 25 local schools wrote, cast, and directed an original play, To Be Human,” which explores a hero’s journey from the origin story through life’s challenges, and onto the discovery that to be a superhero is to be a super human. 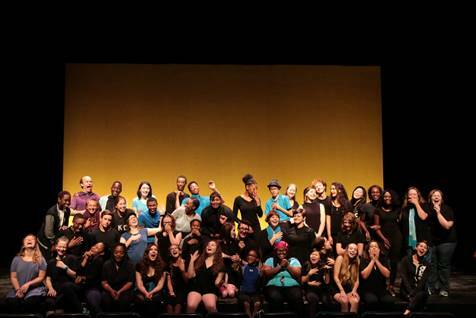 EnrichKC: Summer Youth Theatre Ensemble, or SYTE, is a four-week program open to young artists ages 13-18 in the Kansas City area from July 5 to July 29 at Spencer Theatre on the UMKC Campus. Thanks to the support of generous donors, the program is completely free for every student. In preparation for the program, several workshops were conducted in area schools. KCRep teaching artists guide students through an interactive four-week rehearsal process full of games, ensemble-building activities, playwriting exercises and more. From this process, the student company worked together to write and produce “To Be Human,” which had two performances on the Spencer stage in the Olson Performing Arts Center on the UMKC campus at 7 p.m. Friday, July 28, and at 3 p.m. Saturday, July 29.